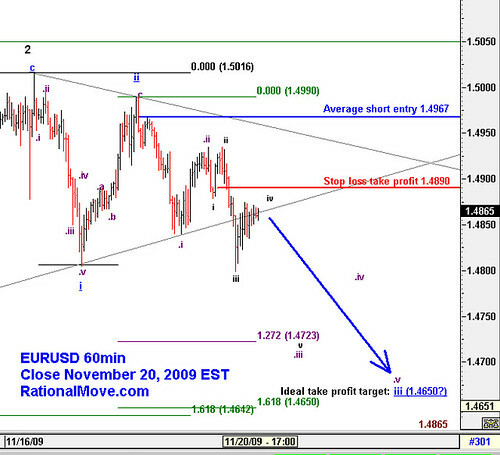 Elliott wave analysis of the week – November 29, 2009, originally uploaded by Rational Move. AUDUSD seems to be crawling up from Dubai shock over the Thanksgiving. It seems to be a clear zigzag rebound which should lead to a mighty black 3 wave towards 0.8760. I made a tweak to my trading strategy, and I will use stop sell order instead of limit; meaning that I will sell when 0.9085 breaks down. If 0.9085 files, I will set my stop to 0.9180. If 0.9180 breaks up before my stop selling filed, I will revise this plan, and attempt the stop selling thing at higher price. I will plan to repeat this stop selling when 0.8890 breaks. I know how much rebound to anticipate by Elliott wave principle, and by using stop entry orders, I will try to buy more probability of winning. This also forces me to have more adequate time before pulling the trigger. More careful planning, and smooth execution. 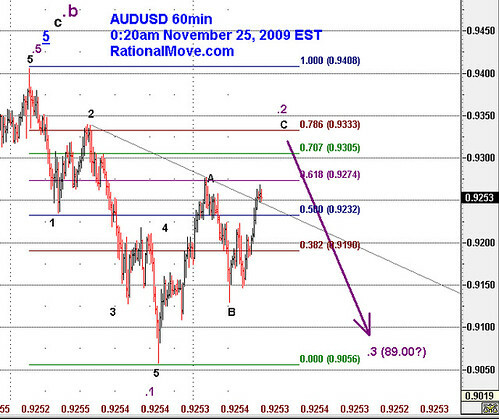 $AUDUSD This is one possibility. 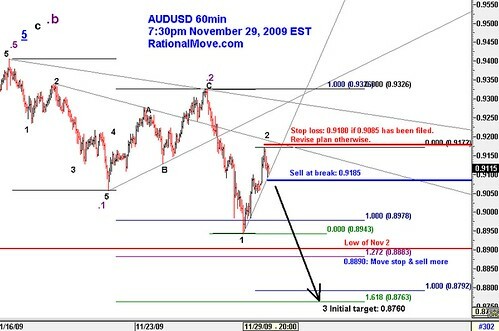 $AUDUSD This is one possibility., originally uploaded by Rational Move. Above is a zoom up of my previous Elliott wave labeled chart. I entered short position averaging 1.49675. I split the position into two units. First one unit was for shorter term trade, and got stopped out with 59 pips profit. 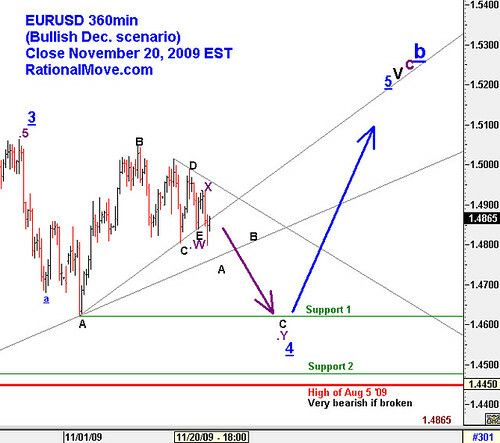 I have been holding on to the second unit, and my ideal take profit level is 1.4650. I believe EURUSD is in purple .iii wave, but so far it’s not very explosive wave downwards, and this made me a bit cautious. So, I set my stop at 1.4890 that would violate the rule to make a wave impulsive: black iv would enter into the territory of the wave black i.
I am keeping my bearish bets, but I am also seeing 40% possibility that EURUSD will continue to go up towards the end of the year. (By the way, I found it interesting to read FT Alphaville’s entry about Goldman Sach expecting equity rally in December, especially in Europe. Now that 1.4805 was broken down by a bit, I would expect the current blue underline 4 wave would pull down to 1.4624 before the beginning of the final EURUSD rally of blue underline 5. This is very convenient for my EURUSD position: I could profit in either scenario by shorting EURUSD towards 1.4650 level. 1.4479 is the last support before this count would become invalid when it crosses the red line (1.4450).